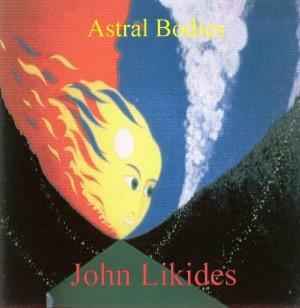 John Likides - "Astral Bodies"
Astral Bodies is John Likides’ second solo CD (I reviewed his third, Paths to Eternity, in AI #22). Unlike Paths to Eternity, this one downplays the role of the guitar in favor of a more purely electronic sound. But this is not a sound like the danceable electronica of the 90’s and the present, nor is it like the deep sonic explorations of the German electronic pioneers, or even the quiet meditations of the ambient musicians. Inspired more by progressive artists like Yes and King Crimson, Likides creates, on Astral Bodies, a structured sound based on sequences, but focusing on melody. Likides’ sequences are often hypnotic, but it’s the melodies that seduce you. Astral Bodies juxtaposes the past and the future, setting elements like the medieval sounding melody of This Groupsoul, the dreamy impressionism of For William Blake and the mysterious, bell-like sequences of For Athena against the sterile beauty of Phase Transition and the rushing traffic-like urgency of Their Finest Hour. In a sense, I found a number of the pieces, like the lovely Requiem for Artigone, had a medieval flavor to them, albeit in a very modern context. It strikes me that the very act of rendering something that feels like it’s from the past, yet utilizing purely modern electronic instruments is, in a way, drawing the connection of our modern selves with those who came before us. This seems to be a theme that runs through Likides’ works, because I heard it on Paths to Eternity as well. But Likides himself says that his albums are intended as soundtracks to his writing, which often deals with themes of technology and reincarnation, so it makes perfect sense. Astral Bodies provides both an intriguing and calming journey into melodic electronic music realms. You can email John Likides at: Likides@aol.com. Contact via snail mail c/o John Likides; GPO 023211; Brooklyn, NY 11202.